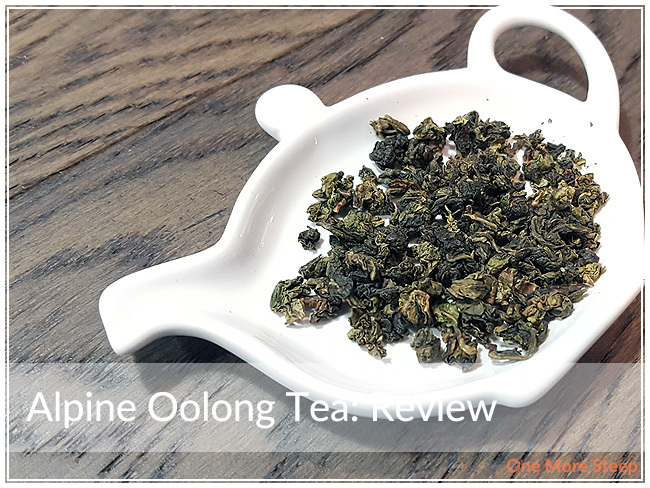 InNature Teas has provided me with Alpine Oolong Tea for the purposes of providing an honest review. Alpine Oolong Tea came to me in a sturdy cardboard box, much like Red Rose Tea did. The tea itself came in a gold foil package, which was not resealable. I remedied this issue by folding the foil package back up and putting it into a sealable plastic bag and into the box. I like keeping teas in original packaging if possible, especially when it’s packaging that’s labelled with information. 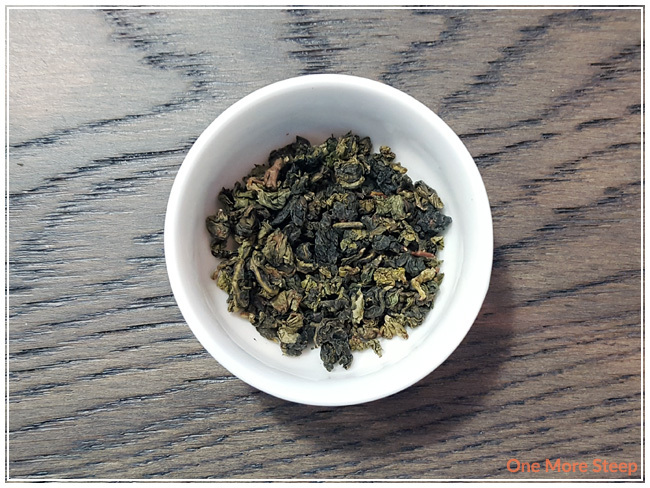 Alpine Oolong Tea is also known as Jie Guan Yin – you may be more familiar with Iron Goodness or Tie Guan Yin or Tie Kwan Yin. 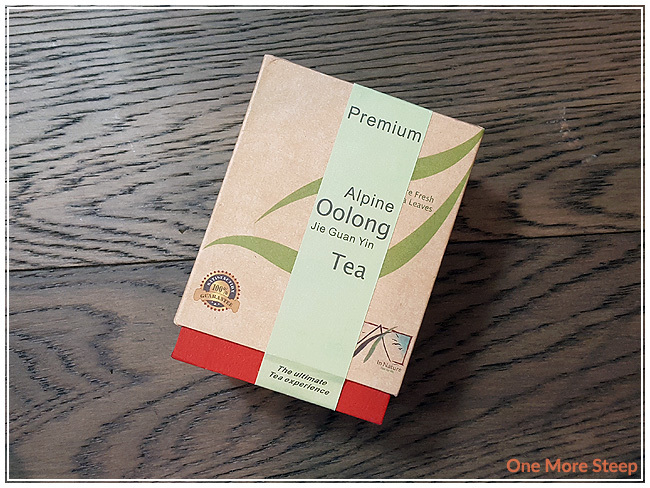 Alpine Oolong Tea is a straight oolong tea. The dry leaf has a strong floral aroma to it. The leaves themselves vary from a bright to a dark green, all tightly bunched and rolled together. I’m really looking forward to steeping these tea leaves and seeing how much they expand. InNature Teas suggests steeping Alpine Oolong Tea in 100°C (212°F) water for 1-2 minutes and suggests that this tea can be steeped up to three times. My initial steep of Alpine Oolong Tea was for 1 minute. The initial step of Alpine Oolong Tea steeps to a pale golden yellow. I found that the aroma to be fairly similar to the dry leaf – mostly floral sweetness. The taste of this tea is surprisingly not as sweet as I expected. There was a smooth floral flavour to this tea, with subtle grassy notes, and a light honeyed sweetness for a finish. There’s a certain level of complexity to this tea that is enjoyable to explore. I resteeped Alpine Oolong Tea a total of five times (six steeps total with the same leaves) and the tea did not disappoint. The oolong steeped to a darker golden yellow with each subsequent steep. The flavour gets a bit stronger – the floral becomes more pronounced, but the sweetness in this tea doesn’t get stronger (which is nice). Because I did so many steeps of this oolong, I did pour the excess Alpine Oolong Tea into a mason jar that wound up in my fridge. Bonus – this tea is excellent cold/iced as well! 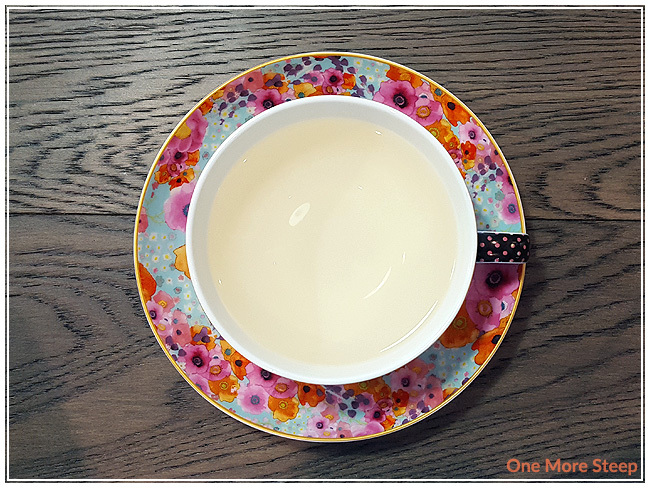 I loved InNature Tea’s Alpine Oolong Tea. I loved the complexity in the flavours and exploring the subtle changes with each steep. I would wholeheartedly recommend resteeping this tea, as the flavours get stronger. This tea would be excellent paired with a meal, I’d think, because it isn’t too sweet to detract from a savoury meal. It’s definitely a tea to resteep over a morning or afternoon, since it holds up so well to being resteeped. I appreciate your web site, very interesting. I have a very similar experience with the Tieguanyin tea that a friend of mine gave me recently.Very similar experience too to the one you describe in the Iron Buddha tea from last year in your website . Smooth and very pleasant flavor. I tried it with local raw honey as sweetener and it potentiates the honey and floral aroma and flavors. The tea is from China and has the Yorker brand (I believe is the name of the brand) as part of the label. Any recommendations of brands that are available in the USA for the Tieguanyin type teas? 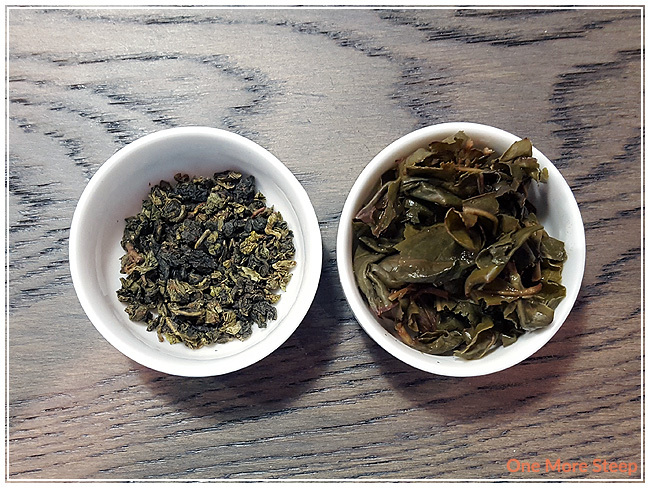 I’ve found a lot of Iron Buddha oolongs available from companies that ship to/in the USA. Off the top of my head, I know that DavidsTea, Murchie’s, Oollo Tea, and Tea Ave all carry that type of oolong and I believe all of them will ship to/within the USA. Cheers!